I am loving this series. This is the third Frank Palmer book I've read, and I'm really hoping for more. This book has mystery, action, and even comedy (when he walks into a law office and tells the officers that he is NOT the notorious bandit, just as a preventative measure). This is all set in a Western setting, and the storyline and characters kept me engaged to the end. I listened to the Audible audio version of this book, and J. Scott Bennett does such a great job narrating. I can picture everything he says in my mind, and he just adds so much to the story. If you like Westerns, I highly recommend this book. 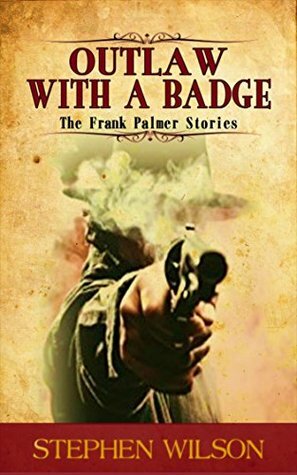 Outlaw with a Badge: The Frank Palmer Western Stories. Book 3: Stephen WilsonThis is book three in the series. Frank Palmer AKA Mark Cross is back trying to juggle his past life with the present. This book has action, adventure, a hint of romance and a touch of humor. The series keep getting better and hopefully there will be more.The narration was well done.The characters were well portrayed. J. Scott Bennett voices this series making it very enjoyable to listen to. "I was voluntarily provided this review copy audiobook at no charge by the author, publisher and/or narrator."